Perhaps most obviously, the Canadian government puts a ceiling on the prices that drug companies can charge, simple as that. Prices for new drugs are capped in two ways. First, the cost of the new drug may be no higher than the cost of existing drugs used to treat the same disease. Then, the law authorizes a review board to insist upon a price reduction when the price of a drug rises above the median of the prices of the med in France, Germany, Italy, Sweden, Switzerland, the United Kingdom, and the United States). [All of the European countries also hold down drug costs, so Canada, as Slate writes, "in effect piggy-backs on other countries' price controls."] This technique is known as "international reference pricing”--and is clearly, as you might imagine, not in great favor among drug companies. And after the launch of the medication? Well, once a maximum drug price for a new patented medication has been set, price increases are limited by changes in the general Consumer Price Index, so they can't rise faster than overall inflation. In fact, the U.S. is the only developed country without some form of price control--and, unsurprisingly, makes up more than half of the pharmaceutical industry's profits. Turns out that while research and development costs are quite expensive, manufacturing costs aren't as high. Thus drug companies can recoup their R&D costs in the U.S., with high drug prices, but can still make a profit in Canada and Europe just by covering the costs of making the pill. Aside from federal government regulating the maximum prices that can be charged for patented drugs, each province’s drug benefit plan encourages price competition among similar medications. The provinces have a couple tools in their arsenal. First, the provincial drug benefit plans will only pay the price of the lowest generic drug for an illness, so new, more expensive, drugs simply aren't covered on the plans. The provincial plans also cap the amount pharmacies are paid per prescription dispensed. In doing so they also clarify how much the pharmacist will be paid for dispensing the medications, and keep costs down. Aside from putting a ceiling on drug prices, there are other reasons for lower drug costs in Canada. For example, the average Canadian's standard of living is 20% to 30% lower than the average American’s. Research indicates that country differences in standard of living play a role in price differences. The theory goes that Americans, with higher incomes, are less sensitive to high prices, and thus can be charged more. Moreover, there's the fact that American litigiousness increases drug costs. 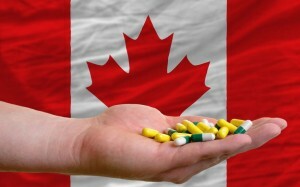 A 1996 white paper entitled "Product Liability and Prescription Drug Prices in Canada and the U.S." quotes a 1992 study that found that 121 of 200 commonly prescribed meds were a median of 43% higher in the U.S. than in Canada at the time. However, the authors determined that one-third to one-half o the differential was due to the higher cost of legal protection from suits in America. Canadian courts limit compensation to 250,000 Canadian dollars, and judges are not prone to hand out large liability settlements. In fact, of the original sample, 26 drugs cost over 100% more in the U.S.; however, claimed the researchers, removing liability would lower that rate to 45%. A final factor in lower Canadian drug prices is direct-to-consumer advertising, which exists in the U.S., but is banned in Canada. Drug companies in America spend billions on direct-to-consumer advertising, and those costs must be defrayed by higher drug costs. Additionally, the advertising increases demand, which in turn increases prices. COVER IT AND THE PRICE IS UNMANAGEABLE. I AM THINKING ABOUT ORDERING FROM CANADA. you left out political lobbyist.